Basic Layouts shows how to use the standard layout managers that are available in Qt: QBoxLayout, QGridLayout, and QFormLayout. The QBoxLayout class lines up widgets horizontally or vertically. QHBoxLayout and QVBoxLayout are convenience subclasses of QBoxLayout. 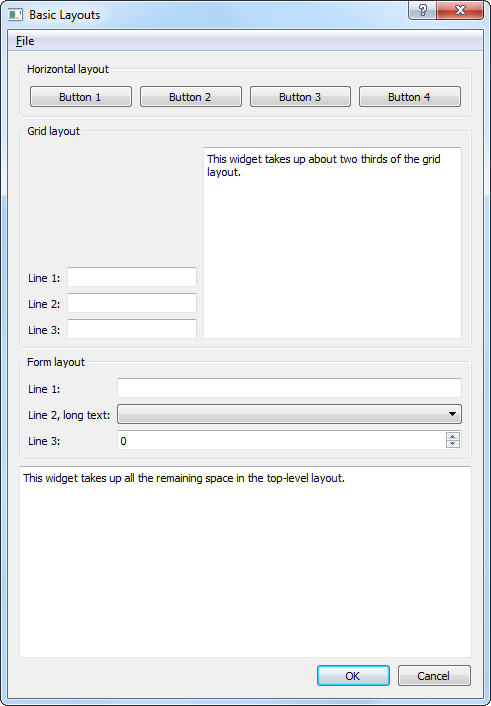 QGridLayout lays out widgets in cells by dividing the available space into rows and columns. QFormLayout, on the other hand, sets its children in a two-column form with labels in the left column and input fields in the right column. The Dialog class inherits QDialog. It is a custom widget that displays its child widgets using the geometry managers: QHBoxLayout, QVBoxLayout, QGridLayout, and QFormLayout. There are four private functions to simplify the class constructor: the createMenu(), createHorizontalGroupBox(), createGridGroupBox(), and createFormGroupBox() functions create several widgets that the example uses to demonstrate how the layout affects their appearances. In the constructor, we first use the createMenu() function to create and populate a menu bar and the createHorizontalGroupBox() function to create a group box containing four buttons with a horizontal layout. Next we use the createGridGroupBox() function to create a group box containing several line edits and a small text editor which are displayed in a grid layout. Finally, we use the createFormGroupBox() function to create a group box with three labels and three input fields: a line edit, a combo box and a spin box. In the createFormGroupBox() function, we use a QFormLayout to neatly arrange objects into two columns - name and field. There are three QLabel objects for names with three corresponding input widgets as fields: a QLineEdit, a QComboBox and a QSpinBox. Unlike QBoxLayout::addWidget() and QGridLayout::addWidget(), we use QFormLayout::addRow() to add widgets to the layout.